What started as a simple attempt to use the ~appWebUrl token in an image URL became a deep dive into SharePoint’s internal processing of custom actions and the App deployment process. In this post, I cover what will and won’t work for custom action image URLs in your own SharePoint 2013 Apps. My adventures in SharePoint 2013 App Model Land have been going pretty well, but I recently encountered a limitation that left me sort of scratching my head. The limitation applies to the creation of custom actions for SharePoint apps. To be more specific: the problem I’ve encountered is that there doesn’t appear to be a way to package and reference (using relative links) custom images for ribbon buttons like the one that’s circled in the image above and to the left. This doesn’t mean that custom images can’t be used, of course, but the work-around isn’t exactly something I’m particularly fond of (nor is it even feasible) in some application scenarios. If you’re not familiar with the new SharePoint 2013 App Model, then you may want to do a little reading before proceeding with this post. I’m only going to cover the App Model concepts that are relevant to the limitation I observed and how to address/work-around it. However, if you are familiar with the new 2013 App Model and creating custom actions in SharePoint 2010, then you may want to jump straight down to the section titled Where the Headaches Begin. One more warning: this post does some heavy digging into SharePoint’s internal processing of custom ribbon actions and URL tokens. If you want to skip all of that and head straight to the practical take-away, jump down to the What About the Image32by32 and Image16by16 Attributes section. First, let me do a quick run-through on custom actions. They aren’t unique to SharePoint 2013 or its new “Cloud App Model.” In fact, the type of custom action I’m talking about (i.e., extending the ribbon) became available when the Ribbon was introduced with SharePoint 2010. 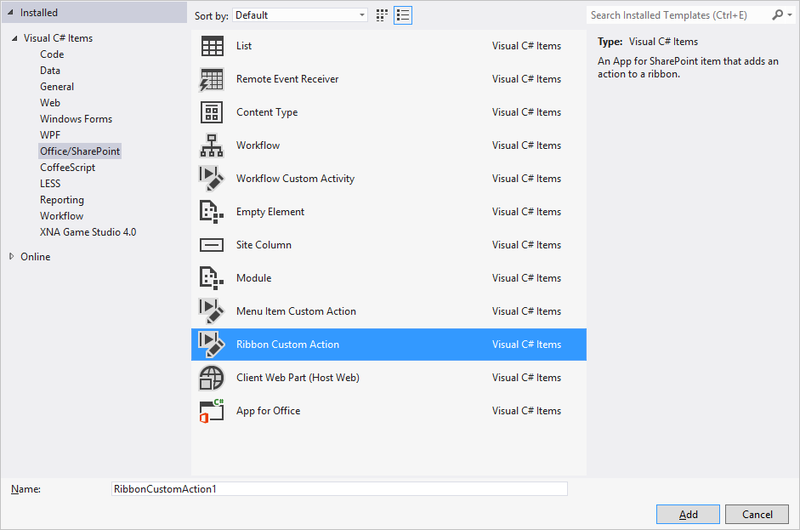 With a SharePoint 2013 App, adding a new button to the ribbon is a relatively simple affair. It starts with choosing the Ribbon Custom Action option from the Add New Item dialog as shown below and to the left. 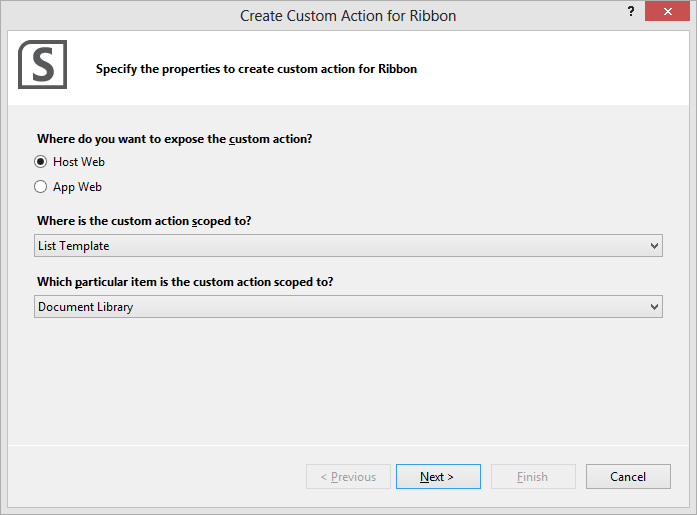 Once a name is provided for the custom action and the Add button is clicked, the Create Custom Action for Ribbon dialog appears as shown below and to the right. There’s a third dialog page that further assists in setting some properties for a custom action, but I’m going to skip over it since it isn’t relevant to the point I’m trying to make. I want to call attention to one of the selections I made on the Create Custom Action for Ribbon dialog, though; specifically, the decision to expose the custom action in the Host Web rather than in the App Web. Why is this choice so important? Well, the new App Model enforces a relatively strict boundary of separation between SharePoint sites and any custom applications (running under the new App Model) that they may contain. A SharePoint site (Host Web) can technically “host” applications, but those applications operate in an isolated App Web that may have components running on an entirely different server. Under the new App Model, no custom app code is running in the Host Web. There are some exceptions to this model of isolation, and one of those exceptions is the use of custom actions to allow an App (residing in an App Web) to partially wire itself into the Host Web. The Create Custom Action for Ribbon dialog shown above, for instance, adds a new button to the ribbon for each of the Document Libraries in the Host Web. This gives users a way to navigate directly from Document Libraries (in the Host Web) to a page in the App Web, for example. Image32by32 and Image16by16 for the <Button /> element. These two attributes specify the images that are used when rendering the custom action button on the ribbon. By default, they point to an orange dot placeholder image that lives in the farm’s _layouts folder. CommandAction for the <CommandUIHandler /> element. In its simplest form, this is the URL of the page to which the user is redirected upon pressing the custom ribbon button. When a user clicks on a custom ribbon button in one of the Host Web document libraries, the goal is to send them over to a page in the App Web where the custom action can be processed. Unfortunately, the default CommandAction isn’t set up in a way that permits this. In fact, attempting to deploy the solution to Office 365 with this default CommandAction results in failure; the App package doesn’t pass validation. Notice that although the /sites/dev2 relative path portion is the same for both the Host Web and App Web URLs, the hostname portion of each URL is different. This is by design, and it helps to enforce the logical separation between the Host Web and App Web – even though the App Web technically resides within the Host Web. And this is exactly what should happen. After all, the custom action is launched from within the Host Web, so a relative path specification should resolve to a location in the Host Web – not the location we actually want to target in the App Web. Thankfully, it isn’t a major undertaking to correct the CommandAction attribute value so that it points to the App Web instead of the Host Web. If you’ve worked with SharePoint at all in the past, then you may know that the key to making everything work (in this situation) is the judicious use of tokens. What are tokens? In this case, tokens are specific string sequences that SharePoint parses at run-time and replaces with a value based on the run-time environment, action that was performed, associated list, or some other context-sensitive value that isn’t known at design-time. The ~appWebUrl token is replaced at run-time with the actual URL of the associated App Web (https://mcdonough-bc920dbeb7ecd3.sharepoint.com/sites/dev2) to build the desired destination link. SharePoint defines a whole host of URL strings and tokens for use in Apps. As it turns out, a fairly complete list has been aggregated and defined in a handy little page on MSDN. Thanks to the always-helpful Andrew Clark for pointing this out to me; I hadn’t realized Microsoft had pulled so many tokens together in one place! Since tokens are the key to inserting context-dependent values at run-time, you’d think they’d have been implemented and usable anywhere a developer needs to cross the Host Web / App Web divide. Since this blog post is about image limitations with custom ribbon buttons, you can probably guess where I’m headed with all of this. So, let’s take a look at the Image16by16 and Image32by32 attributes. I deployed my App to my Office 365 Preview tenant, watched my browser launch into my App Web, hopped back to the Host Web, navigated to a document library, and looked at the toolbar. I was not happy by what I saw (on the left). The image I had specified for use by the button wasn’t being used. All I had was a broken image link. Examining the properties for the broken image quickly confirmed my fear: the ~appWebUrl token was not being processed for either of the Image32by32 or Image16by16 attributes. The token was being output directly into the image references. I tried changing the image attributes to reference the App Web a couple of different ways (and with a couple of different tokens), but none of them seemed to work. I did a little digging, and I saw that Chris Hopkins (over at Microsoft) covered this very topic for sandboxed solutions in SharePoint 2010. In Chris’ article, though, it was clear that tokens such as ~site and ~sitecollection were valid for use by the Image32by32 and Image16by16 attributes. To see if I was losing my mind, I decided to try a little experiment. Although I knew it wouldn’t solve my particular problem, I decided to try using the ~site token just to see if it would be parsed properly. Lo and behold, it was parsed and replaced. ~site worked. So, ~site worked … but ~appWebUrl didn’t? That didn’t make any sense. If it isn’t possible to use the ~appWebUrl token, how are developers supposed to reference custom images for the buttons they deploy in their Apps? Without the ~appWebUrl, there’s no practical way to reference an item in the App Web from the Host Web. When I find myself in situations where I’m holding results that don’t make sense, I can’t help myself: I pull out Reflector and start poking around for clues inside SharePoint’s plumbing. If I dig really hard, sometimes I find answers to my questions. Although these methods together are capable of recognizing and replacing many different token types (including some I hadn’t seen listed in existing documentation; e.g., ~siteCollectionLayouts), none of the new SharePoint 2013 tokens, like the ~appWebUrl and ~remoteWebUrl ~remoteAppUrl tokens, appear in these methods. Interestingly enough, I didn’t see any noteworthy differences between the path of execution for processing image attributes and the sequence of calls through which CommandAction attributes are handled in the RegisterCommandUIExtension method of the SPRibbon type. The RegisterCommandUIExtension method eventually “punches down” to the ReplaceUrlTokens and UrlFromPrefixedUrlCore methods, as well. The differences I was seeing in how tokens were handled between the CommandAction and Image32by32/Image16by16 attributes had to be originating somewhere else – not in the processing of the custom action XML. After some more digging in Reflector to determine where the ~appWebUrl actually showed-up and was being processed, I came across evidence suggesting that “something special” was happening on App deployment rather than at run-time. The ~appWebUrl token was being processed as part of a BuildTokenMap call in the SPAppInstance type; looking at the call chain for the BuildTokenMap method revealed that it was getting called during some App deployment operations processing. If changes were taking place on App deployment, then I had a hunch I might find what I was looking for in the content database housing the Host Web to which my App was being deployed. After all, Apps get deployed to App Webs that reside within a Host Web, and Host Webs live in content databases … so, all of the pieces of my App had to exist (in some form) in the content database. I fired-up Visual Studio, stopped deploying to Office 365, and started deploying my App to a site collection on my local SharePoint 2013 VM farm. Once my App was deployed, I launched SQL Management Studio on the SQL Server housing the SharePoint databases and began poking around inside the content database where the target site collection was located. Brief aside: standard rules still apply in SharePoint 2013, so I’ll mention them here for those who may not know them. Don’t poke around inside content databases (or any other databases) in live SharePoint environments you care about. As with previous versions, querying and working against live databases may hurt performance and lead to bigger problems. If you want to play with the contents of a SharePoint database, either create a SQL snapshot of it (and work against the snapshot) or mount a backup copy of the database in a test environment. … and the CommandAction attribute. Jumping into my App in Internet Explorer and opening IE’s debugging tools via <F12>, I did a search for the LaunchApp function within the referenced scripts and found it in the core.js library/script. Examining the LaunchApp function revealed that it called the LaunchAppInternal function; LaunchAppInternal, in turn, called back to the SharePoint server’s /_layouts/15/appredirect.aspx page with the parameters that were supplied to the original LaunchApp method – including the URL with the ~appWebUrl token. 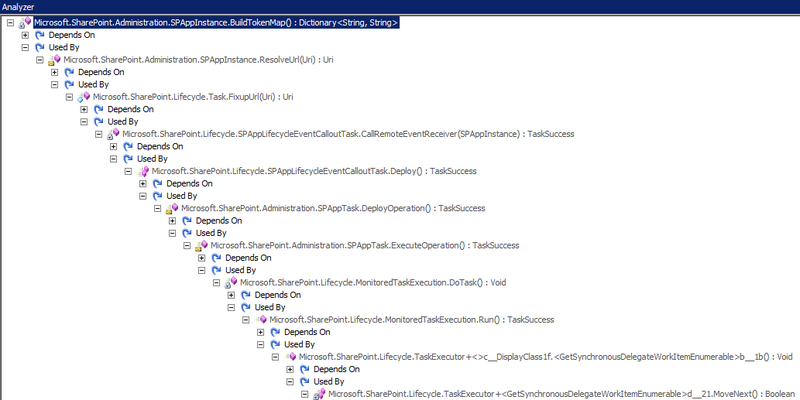 To complete the journey, I opened up the Microsoft.SharePoint.ApplicationPages.dll assembly back on the server and dug into the AppRedirectPage class that provides the code-behind support for the AppRedirect.aspx page. When the AppRedirect.aspx page is loaded, control passes to the page’s OnLoad event and then to the HandleRequest method. HandleRequest then uses the ReplaceAppTokensAndFixLaunchUrl method of the SPTenantAppUtils class to process tokens. The ReplaceAppTokensAndFixLaunchUrl method is noteworthy because it includes parsing and replacement support for the ~appWebUrl token, ~remoteWebUrl ~remoteAppUrl token, and other tokens that were introduced with SharePoint 2013. The deployment-time processing that is performed on the CommandAction attribute is what ultimately wires-up the CommandAction to the ReplaceAppTokensAndFixLaunchUrl method. The Image32by32 and Image16by16 attributes don’t get this treatment, and so the new 2013 tokens (like ~appWebUrl) can’t be used by these attributes. What About the Image32by32 and Image16by16 Attributes? Now that some of the key differences in processing between the CommandAction attribute and image attributes have been identified, let me jump back to the original problem. Is there anything that can be done with the Image32by32 and Image16by16 attributes that are specified in a custom action to get them to reference assets that exist in the App Web? Since tokens like ~appWebUrl (and ~remoteWebUrl for all you Autohosted and Provider-hosted application builders) aren’t parsed and processed, are there alternatives? I had some initial concerns that I might inadvertently bump into some security boundaries, such as those that sometimes arise when an asset is referenced via HTTP from a site that is being served up under HTTPS. This didn’t prove to be the case, however. I tested the use of absolute URLs in both my development VM environment (served up under HTTP) and through one of my Office 365 Preview site collections (accessed via HTTPS), and no browser security warnings popped up. The target image appeared on the custom button as desired (shown on the left) in both cases. Although the use of absolute URLs will work in many cases, I have to admit that I’m still not a big fan of this approach – especially for SharePoint-hosted apps like the one I’ve been working on. Even though Office 365 entails an “always connected” scenario, I can easily envision on-premises deployment environments that are taken offline some or all of the time. I can also see (and have seen in the past) SharePoint environments where unfettered Internet access is the exception rather than the rule. In these environments, users won’t see image buttons at all – just blank placeholders or broken image links. After all, without Internet access there is no way to resolve and download the referenced button images. At some point in the future, I hope that Microsoft considers extending token parsing for URL-based attributes like Image32by32 and Image16by16 to include the ~appWebUrl, ~remoteWebUrl, and other new tokens used by the SharePoint 2013 App Model. In the meantime, though, you should probably consider getting an easily accessible online location (SkyDrive, Dropbox, a blog, etc.) for images and other similar assets if you’re building apps under the new SharePoint 2013 App Model and intend to use custom actions. I need to issue a couple of updates and clarifications. First, I need to be very clear and state that SharePoint-hosted apps were the focus of this post. In a SharePoint-hosted app, what I’ve written is correct: there is no processing of “new” 2013 tokens (like ~appWebUrl and ~remoteAppUrl) for the Image32by32 and Image16by16 attributes. Interestingly enough, though, there does appear to be processing of the ~remoteAppUrl in the Image32by32 and Image16by16 attributes specifically for the other application types such as provider-hosted apps and autohosted apps. Jamie Rance mentioned this in a comment (below), and I verified it with an autohosted app that I quickly spun-up. I double-checked to see if the ~remoteAppUrl token would even be recognized/processed (despite the lack of a remote web component) for SharePoint-hosted apps, and it is not … nor is ~appWebUrl token processed for autohosted apps. The selective implementation of only the ~remoteAppUrl token for certain app types has me baffled; I hope that we’ll eventually see some clarification or changes. If you’re building provider-hosted or autohosted apps, though, this does give you a way to redirect image requests to your remote web application rather than an absolute endpoint. Thank you, Jamie, for the information! 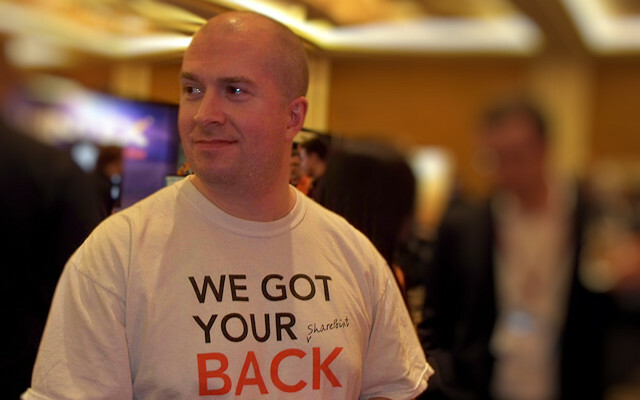 And now for some good news that for SharePoint-hosted app creators. 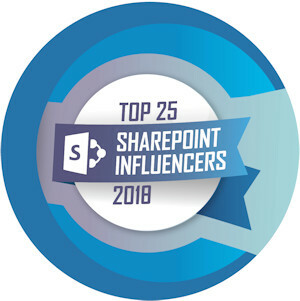 Prior to writing this post, I had posted a question about the tokens over in the SharePoint Exchange forums. At the time I wrote this post, there hadn’t been any activity to suggest that a solution or workaround existed. F. Aquino recently supplied an incredibly creative answer, though, that involves using a data URI to Base64-encode the images and package them directly into the Image32by32 and Image16by16 attributes themselves! Although this means that some image pre-processing will be required to package images, it gets around the requirement of being “always-connected.” This is an awesome technique, and I’ll certainly be adding it to my arsenal. Thank you, F. Aquino! Thanks for the detailed research into this issue. An alternate solution to using an absolute URL is to use the ~remoteAppUrl token if your app has a remote web. I have confirmed that this works. You mention the token ~remoteWebUrl not working but that is not the correct token for the remote web. Strange that MS would correctly wire up the ~remoteAppUrl but not the ~appWebUrl token. Thanks for the feedback, Jamie – I really appreciate it! I also appreciate you pointing out that I had the wrong token (~remoteWebUrl vs. ~remoteAppUrl) for remote app/web references. I’ve gone back through the post and cleaned that up. Since the focus of this post was SharePoint-hosted apps, there isn’t (unfortunately) a remote web that can be referenced. The information you supplied will definitely be of interest to those who are building provider-hosted and autohosted apps, though. I agree that it’s strange that Microsoft would permit tokens in one class of apps but not the other? I don’t know if it was an oversight or deliberate, but it does leave SharePoint-hosted app creators (including those using Napa) in a rough spot. At some point, I hope to have the time to dig in and see where the differences in processing exist between SharePoint-hosted apps and autohosted+provider-hosted apps. I did my verification testing (for the information you supplied) with an autohosted app; unfortunately, I can’t do much “server side” analysis (or database-digging) in that sort of situation. Again, thanks for the correction and for the additional information! I wanted to note that I had similar issues from within the app web (not the host), trying to access the ~site token for the SPShortCutIcon favicon link. Nothing I did worked, it wouldn’t parse any token and just inserted it as part of the url. I ended up using a html link tag that was able to parse it successfully. So weird. Thanks for all of the great detective work you put into this post Sean. Wow! I have this very situation open with the SharePoint Product Team and if they end up with a good response, I’ll will let you know. To me this is a bug, the 2013 tokens you describe above should clearly be getting resolved. I can confirm that they are not. It should work. Let me know if you decide to give it a try. Your workaround (with the InstalledEventEndpoint) sounds interesting and is very clever. I’ve been giving it some thought. I hope I get a chance to play with it and try it; if I do, I’ll post something with my findings. The one thought I have (thinking of the App I was working on when the problem arose) was that I had only requested read permissions to the host web within my AppManifest. The App itself wasn’t actually writing any content into the host web – just reading from it. I suspect I’d need to ask for additional permissions to attempt the icon upload: not a game-stopper by any stretch, just an additional consideration. Again, I appreciate the note and suggestion! Yep, the workaround would demand write access to the Host Web. But App Permissions are totally broken today anyway. So, if you do anything of consequence, you will probably have to ask for Full Control of the Web anyway. Also, business users will totally “Trust It” to do anything if they want your functionality. Just yesterday, I proposed to the SharePoint Product Team that it would really be great if we could ask for elevated App Permissions explicitly for provisioning assets into the Host Web and then drop back to Read only. We’ll see what they decide to do here. Best case scenario, SharePoint is patched to resolve the URL tokens. I really like your idea of elevated permissions for provisioning, as it mimics the pattern we have to follow now with full-trust solutions and FeatureReceivers. And yeah: those who install the Apps will click “Trust It” regardless of the permissions listed, so there’s something of an “impedance mismatch” between the granularity of our (i.e., dev) focus and those who are supposed to be scrutinizing what they install. Thanks again, and I hope you’re able to sway the product team! They are way too busy with SP2013 GA happening on Office 365 next Wednesday to think about SP1. Just an update: I hadn’t had a chance to try your suggestion, Todd, but some recent reading leaves me with the (unfortunate) impression that it wouldn’t be possible to leverage the InstalledEventEndpoint in the App Manifest. I’ve been reading through Scot Hillier and Ted Pattison’s “Microsoft SharePoint 2013 App Development” book (very targeted, tidy, and helpful book), and they indicated that the App Manifest events tied to installation, uninstallation, and upgrading actually need to be backed by IRemoteEventService (WCF) implementation. This limits their usefulness almost exclusively to provider-hosted and autohosted apps. Thanks again for the suggestion and feedback! In this new “App World,” I think we’re going to be trying (or continuing to try) a lot of new and (possibly) crazy things. Hi and thanks for this useful post. I had a problem and wondering maybe you can help me out. I want to create custom Action (site action) which opens a a page in the App Web ? is it possible? Thanks for the feedback! You asked about creating a site action for Apps; based on the docs I’ve seen (specifically: http://msdn.microsoft.com/en-us/library/jj163954.aspx), it doesn’t appear possible. You can extend the ECB and ribbon, but the docs don’t cover site actions. Other options, like the site actions menu, may be possible … but I haven’t tried to push the system any further. Where MyApp ist the name of your app as written in the manifest. The generated image URL goes to the host web, but is getting redirected by the host to the app web. 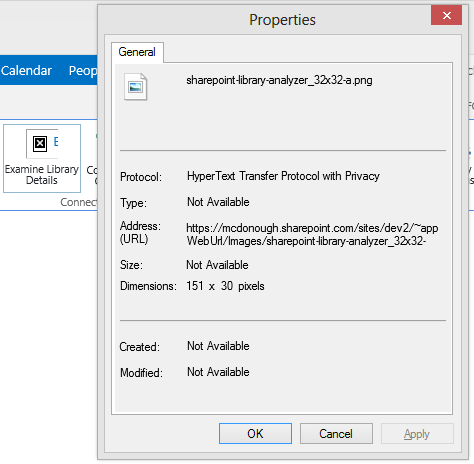 Tried this in SharePoint-hosted and the tile does not show up in the “Documents” library. Next Next post: Wrap-Up, Roll-Up, and Move-On!